The long double pointed needles you can buy now mean that it is possible to hold more stitches on the needle with the weight of the knitting on your lap. So you can make a blanket all in one go. But even so there are advantages in making a blanket out of smaller squares. The traditional blanket made out of knitted squares was a useful way of using up oddments of yarn. 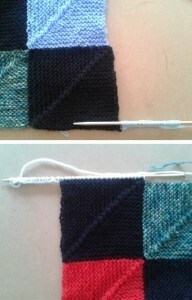 Knitting individual squares means that you never have too many stitches on the needle at once. A blanket knitted all in one go can sag and stretch. But, the big problem with the traditional squares was sewing them together as this is difficult to do well. The sewing has to be firm but not lumpy. However, this pattern allows you to make a blanket out of squares without having to sew them together. The result has a much better tension, drape and feel than a sewn blanket. Cast on 41 stitches. Knit one row. Turn. The right side of the work is now facing you. Knit 19. Knit 3 together through back of loops. Knit 19. Knit 18. Knit 3 together through back of loops. Knit 18. Continue in this way until 3 stitches remain. Knit 3 together and fasten off. This is your first square and will be on the bottom left hand corner of the finished blanket with the line of knit 3 tog stitches going from bottom left to top right. To make the next square, cast on 21, preferably with thumb method, and, with the stitches on the right hand needle, pick up 20 stitches along the right hand side of the first square. Work the second square on these stitches. Make as many squares as you want on the bottom row. To make the left hand square on the next row, pick up 20 stitches along the top of the first square then cast on 21 stitches, using a ‘knitting on’ technique so you are going left to right. Work the square on these stitches. For the next, and all subsequent squares on that row, pick up 20 stitches on the top of the square below, one stitch right in the corner and 20 stitches up the right hand side of the previous square. Make as many rows as you want. Weave in as many ends as you can while working, fasten off any remaining ends. To finish it off really neatly, use a long double pointed needle and pick up 20 sts along each square on one side. Knit 3 or 5 rows and cast off all but the last stitch. Pick up 3 or 5 sts along the side you have just knitted then 20 sts along each square on the next side and repeat. Do the same for the remaining two sides.